Monica Cannon-Grant, center, lists off the names of 43 gun homicide victims to a crowd of students and activists outside Boston Mayor Marty Walsh's office. The group was protesting gun violence and school closures in the city. Over 200 students and community members filled the hall near Boston Mayor Marty Walsh's office, sitting and holding signs. Their protest lasted 43 minutes, each minute commemorating the life of a city gun homicide victim. According to Monica Cannon-Grant, who organized the protest, there were 180 people shot in Boston over the past year, including 43 who were killed by gunfire. "We are calling out the names of homicide victims. They need to be heard and they need to be acknowledged. All 43 from this past year. This isn't normal, it isn't normal at all," said Cannon-Grant, who founded the activist group Violence in Boston Inc. and ran for state representative in 2016. Cannon-Grant organized the protest and school walkout with no clear way to gauge how many students would turn out. Outside City Hall on Monday, she gasped as a crowd of teenagers flowed out of the Government Center MBTA station. "Are they here for us? My God, they are," she whispered to her friend and fellow activist James Mackey. Halfway through the protest, which was dubbed a "die-in," a group of additional students gathered outside to show their support. For Excel High School senior Fatima Eddahbi, the protest was part of a much larger process. "This protest is a small piece of the puzzle," Eddahbi said. "Small steps always lead to larger ones, and this here today is crucial to getting our message across." 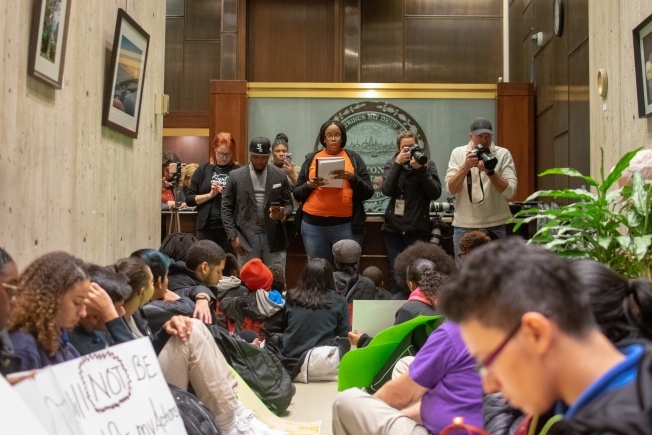 Violence in Boston Inc. provided a list of demands to Walsh's office following the protest, calling for "...fully funded public education, a stop to school closures, a violence prevention plan, an allocation of budget funding to ensure youth employment year round and trauma services for BPS young people and communities of color." Before the protest, Cannon-Grant was joined by City Councilor Kim Janey, who represents Boston's Seventh District. "We need to stand up and say this is not okay when our young people are dying in the street," Janey told State House News Service. "I also think the school closures are problematic as well. We need to communicate to our children that they have value, and make sure that we look at the challenges those schools are facing and what our options are." The protest specifically addressed the potential closures of West Roxbury High School and the McCormick Middle School in Dorchester. The closures were announced as part of the city's BuildBPS plan, developed in 2015 when Tommy Chang served as superintendent of schools. According to city officials, the West Roxbury High School building requires extensive repairs, while the McCormack school is being closed as part of the department's plan to shut down all six of its remaining middle schools in order to switch the city fully into a K-6, 7-12 grade configuration. Current interim Superintendent Laura Perille has publicly acknowledged the difficulty of the proposed school closings. In a statement, Perille said that "there are some difficult choices, and in some cases unavoidable decisions, along the way." While the BuildBPS plan will close both schools, the department says that the plan places an emphasis on neighborhood schools, and proposes constructing new elementary schools in areas of the city with the greatest number of students and the fewest number of seats. When asked about the protest, the mayor's office provided no comment. Students from more than eight area schools gathered at City Hall. As the names of victims were called, students hugged and cried. In October, there were eight killings in Boston over the span of 11 days. The last to die was Alicia Restrepo, a 24-year-old mom. Her name was among the last called, spurring a series of cries from the sitting crowd. "It pains me to hear these names," said Mackey, who stood by Cannon-Grant as she read them off. "But you know who needs to hear them? They do," he said as he pointed to the mayor's office door. Students also passed around a pair of white sneakers to leave the mayor, each of them signing one with a marker. "We want Mayor Walsh to take a walk in our shoes," Cannon-Grant said. "We want him to feel the pain we feel. So we are leaving these here for him today."